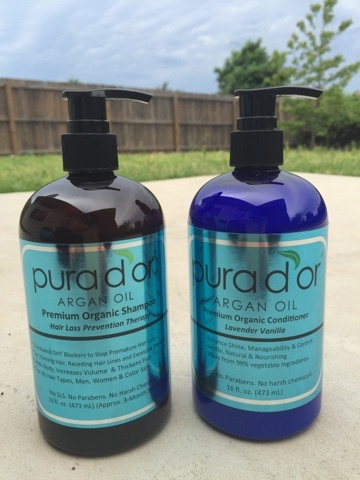 Pura d'Or Organic Shampoo & Conditioner "Review + Giveaway"
I have just begun my journey in using naturally made products and this hair product is setting my standards high! I am pleasantly surprised that my hair can look so smooth and silky with all natural ingredients and all i see little less hair in the drain. It makes sense I guess, No more harsh chemicals to strip my hair of all that is it meant to be "Natural". Their Organic shampoos and conditioners on the other hand are designed to cleanse and nourish hair with all natural ingredients. My hair is short,quite thick and I only need to use about the size of a dime. You really need to work the shampoo through the hair. It was a little different to have a lather... But I would rather this happen than have to deal with a chemically infested product. Now here comes my next question-- what's stopping you from trying these organic hair products right now? So do enter yourself to win this awesome stuff.. ! !